Looking for a very affordable SUV that seats 7 and gets an average of 21 mpg? Then the Nissan Pathfinder is perfect for your family. 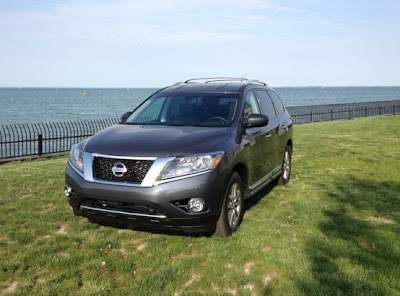 The 2013 Nissan Pathfinder gets 19 and 25mpg so this SUV gets decent gas mileage for a large SUV. I used this Pathfinder the entire week I had it. I had 3 appointments that week and we even made a trip to the zoo, the car was returned with 1/2 tank of gas! It's not a gas guzzler at all and that is a feature that I look for in a vehicle. This SUV starts at a base price of $28,650 and it has plenty of features that any family would love. One of my personal favorites is the push start. As long as the key is within a certain amount of feet from the car you can push the brake and push the button. This allows me to leave my keys in my purse while in the car and start it without issue. It also has the wonderful rear backup camera. And if you turn your wheel the yellow bar turns with you to show you exactly where you're going. The Pathfinder easily and comfortably seats 7 passengers. Two in the front seats, three in the 2nd row and two in the very back. Most 3rd rows are pretty hard to get to, but Nissan's EZ Flex Seating System makes it very easy. and then you push the seat forward to easily access the third row. Both rows of seats completely fold down to expose 79.8 cu ft of space. Even my husband at 5'10" and 260 pounds was able to very comfortably fit in the 2nd row of this vehicle. Overall this vehicle was a breeze to drive. It is a 4x4 and you can set it to automatic or lock it in 4x4 mode. It has heated seats and has a gorgeous center console area. As well as steering wheel mounted controls. The Nissan Pathfinder is a great family vehicle and has plenty of space for a growing family. The 2013 Nissan Pathfinder has received an award for the Highest Government Side-Impact Safety Rating, definitely a wonderful award to have on your vehicle if you have children. If you're looking for a gorgeous SUV this may be it for you. I highly recommend this SUV for anyone looking for one! *Disclaimer, I received a Nissan Pathfinder for a 1 week test drive. All opinions here are 100% my own and I was not compensated to write this post, other than receiving the vehicle. Wow, that is very spacious inside. I don't think they used to be that roomy. Thanks for sharing! nissans are nice. i love all of the safety features they have! I would love to have such a luxurious car as this nissan. Safe, spacious, and i like the trunk a lot. Wow, that's a nice and spacious vehicle! Would be great for hauling two and four legged family around! What about air vents in the back? It seems like they always forget to put these in standard SUV, Ike the Hyundai Tucson Limited which I have. I love my back up camera and the side view movement would be great to have as well. I have yet to try push start, but those that have it...love it. Sweet ride! You are so lucky to get to try these out! I love have spacious this is, with third row seating. With three boys this would be super nice. This sure would be a great vehicle for my son and his 5 children. Love it! I love the interior, looks so comfortable! The push button start is such a neat feature! It sounds like the perfect vehicle! It certainly has amazing features and is very attractive. I would have camped in it for the week! Nice car! I like that it's spacious. Thank you for the review! Oh my this pathfinder is so beautiful!! i never knew they were so luxurious!! so lucky i love that it seats 7!! My hubby and I were thinking of getting a Honda Pilot when we upgrade to a bigger car with a bigger family. But now seeing this, we are going to have to go test drive one! What a great review. I'm looking to sell my car and get something a little more roomy. This looks like a wonderful vehicle! This vehicle looks so roomy! I could use a bigger vehicle with a toddler and a baby on the way! I also love the rear back up camera! I love the extra cargo space in the trunk floor! looks very roomy....if I were in the market for a vehicle that big I would deiniftely consider it! Looks spacious! Your pictures give me a better perpsctive than the Nissan site does-thanks. very nice vehicle thanks for sharing..
Loving the third row seating. What a nice, sleek vehicle. I used to have a Nissan Xterra, it was a awesome car. This one looks so comfy and spacious! Thank you for sharing! I love my Nissan Altima. I would consider buying one of these if/when I upgrade! I love the interior. So sleek. I love that this seats 7 people. We are out growing my car, but I really don't want a mini van, I think this would be perfect for my family! Wow great car, love the 3 rows of seats, and the extra storage space in the back is an added bonus.. Nissans are great vehicles. It looks so roomy. A great choice for a family. I love that you can't lock your key in the car.... definitely need that! I love the 3rd row of seating! I wish we had that. This looks like such a awesome car. I wish we were in the market for a new one. Love that you can't lock your keys in the car... lol, definitely a must for me! Wow! So much space inside! Pretty cool. I love cars that have the push button start feature it's so cool! I haven't seen the new Pathfinders! They look a lot like the Acadias! I love how the mirrors rotate down and then back up! I did not realize the Pathfinder had a third row. I am impressed with the amount of leg room available. Pathfinders have always been really nice SUV's. Your review is fantastic! beautiful vehicle. would be great for our growing family so I'll add it to the list of "to look at"
This is a really sharp looking vehicle! Love the space in it! Lovin this blog! So gonna pass it on to my preggo sis-in-law!! Very spacious! It would even fit my giant English Mastiff dog comfortably! 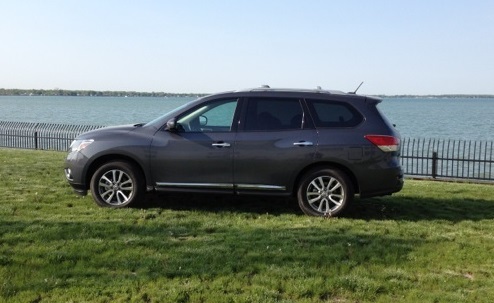 Love all the features of the Nissan Pathfinder. I have a GMC Envoy and it is a gas gussler! I also locked the keys in it the first week I had it and it was running! I also dented up the driver's side door backing up, so this Nissan sounds great. Thanks for the review. LOVE all the storage space. The vehicle I currently own also has a push to start button, and it is a MUST. So nice that the Pathfinder has this (for me) essential feature! I love the fact that you can't lock your keys in the car. I can't even imagine how many times I've done that lol. The push start is awesome too! I hate fishing for my keys! I really love this. It is very luxurious for a mini van. I love the back up cam too. Thanks for giving us an honest review. Wow that car is beautiful! Where is mine? :). I really want one of those. You have me so interested! Wow I'd be happy with half of those features! We have a Nissan and love it. It's a 1995 and still runs great! These are well made cars. I'm in the market for an SUV, and do need to find a vehicle that is reliable and affordable. I've had Nissans in the past and have been very happy with them. 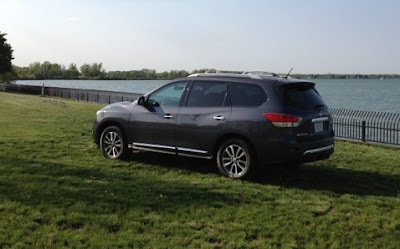 I like the look of the Nissan Pathfinder and the features. Thanks for the review. My husband and I have been thinking about upgrading to an SUV and we will have to consider the Pathfinder thanks to your review! It looks awesome and has all the features we need, I especially love the easy fold-down seats. I want this so bad. It is my car.I love the way it looks and when I test drove it I loved the height! Wow the pathfinder has come along way! My mom had one in the 90s but this one is much nicer! what an awesome car with great features. I would love to have one of these! I love the backup camera! What a great idea, especially for if you have kids. Thank you for your review; it was very helpful. My husband and I were just talking this morning about buying a new vehicle and the Pathfinder is now #1 on my list. I've always wanted a Pathfinder. I love the back up camera and how spacious the inside is. I was wondering what the Pathfinder looked like inside. It has a lot of room, and I like the gadgets!! It is very nice!! 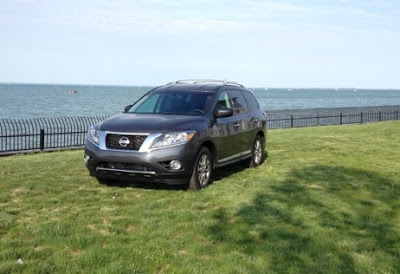 I like my Nissan Rogue but after seeing the Pathfinder, I think that it will be my next! That is a great idea making it so you can't lock the keys in the car. These are really nice vehicles. My cousin has one and I absolutely fell in love with it. I love everything about it. It's roomy and very comfortable and it drives so smooth. My Wife and I just purchased our 2013 Nissan Pathfinder. We do like it and are happy about out purchase, however, our car just locked us out with both keys in the car. We were also told that it was impossible to lock your keys in the car. This is obviously not true. We left the keys in the car while we were unloading out my in-laws and got a bite to eat. When we went out to finish unloading SURPRISE!!!! All the doors were locked and we could not even unlock it by the magic silver button on the front doors. Very frustrating!!! i've been wanting some reviews for great family cars! thank you for these!! I have been looking into finding a vehicle for our family that has a third row! The problem that I am finding is that once you either have enough room for the third row there is no trunk space or if there is enough trunk space you have horrible gas millage. This looks like it has the space and the better gas millage. We will have to take a look at one. Thank you for the review! What an informative review! This vehicle sounds like a wonderful option for me to look at when I begin car shopping again. Maybe the newer model though! What a sweet and quality car. I thank you for this awesome review. What a car to own!